I suppose that anyone who has lived in New England will always compare autumn foliage elsewhere to the blazing maples of memory. However, I loved these golden leaves against the deep blue Southwestern skies, seen as we rode our bikes yesterday along La Llorona Trail. 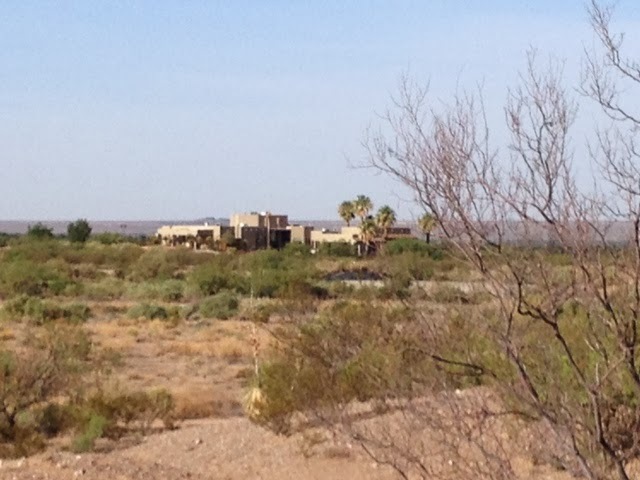 The warm October afternoon and the sight of the Organ Mountains and Picacho Peak in the distance didn't hurt, either. This post is really for my kids. I came across this old photo of the Pretty Room in the house on High Street, which I've written about before on this blog. (Follow the links and you'll find the story about how we came to live in our very own 1770 New Hampshire Colonial home, ghosts and all). 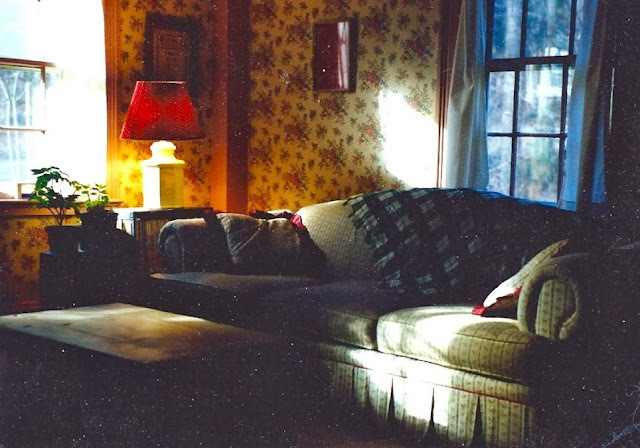 This was the room that always felt like a quiet, peaceful island in the middle of a busy house. When the window behind the sofa was open you could smell the garden and the little white climbing roses. It makes me smile to think of it. The City of Las Cruces, together with New Mexico State University and several health initiative and planning organizations, has published a booklet called the Las Cruces Prescription Trails Program Walking Trail Guide. The very first walk it describes brought us to Tellbrook Park, a small neighborhood park tucked into a side street over on the other side of town. I don't think we would have found this little gem without the booklet. 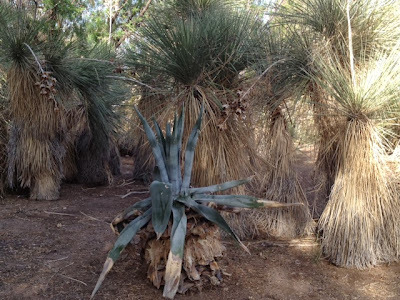 We have friends who live nearby who had never heard of the place. 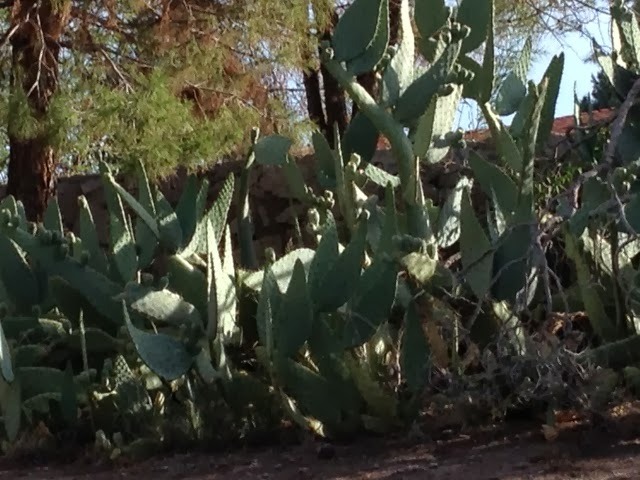 many cacti. 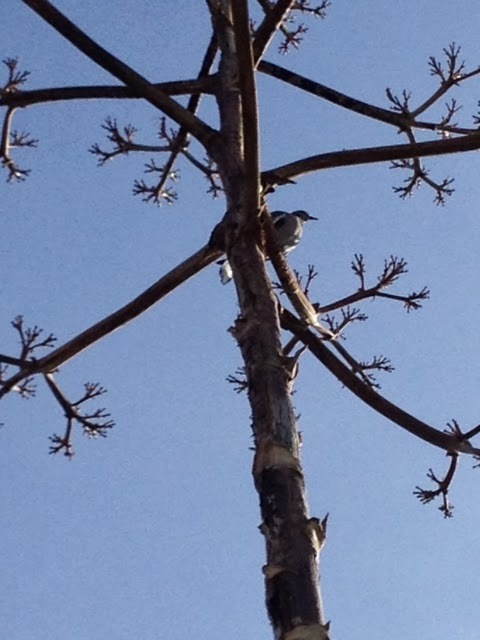 We spotted some white-winged doves up in this odd-looking tree. 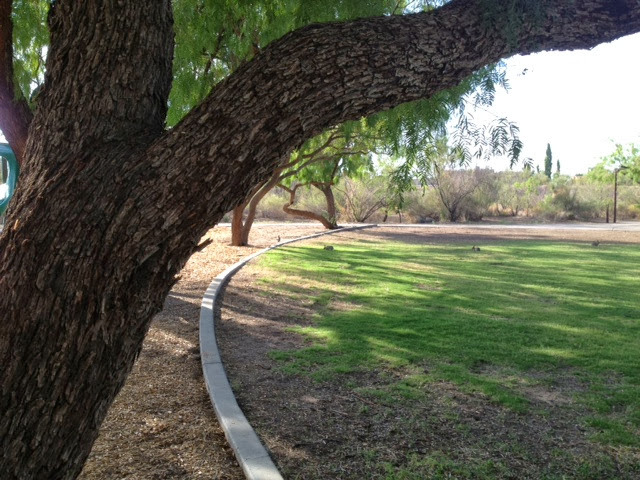 This green lawn made us stop a while; green grass being a real rarity where we live in the Chihuahuan Desert. Now, this is the part where you will need to do some careful looking--a bit of imagination will help, too. On the far side of the lawn you might just be able to make out three little rabbits, nibbling away at the grass. I was wishing for a big camera, or a telephoto lens, but had to make do with my iPhone camera. 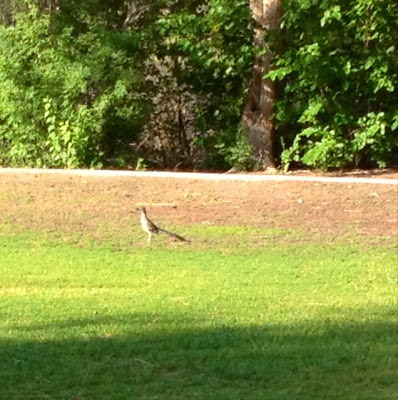 Glancing over to the other side of the lawn, we spotted a roadrunner. 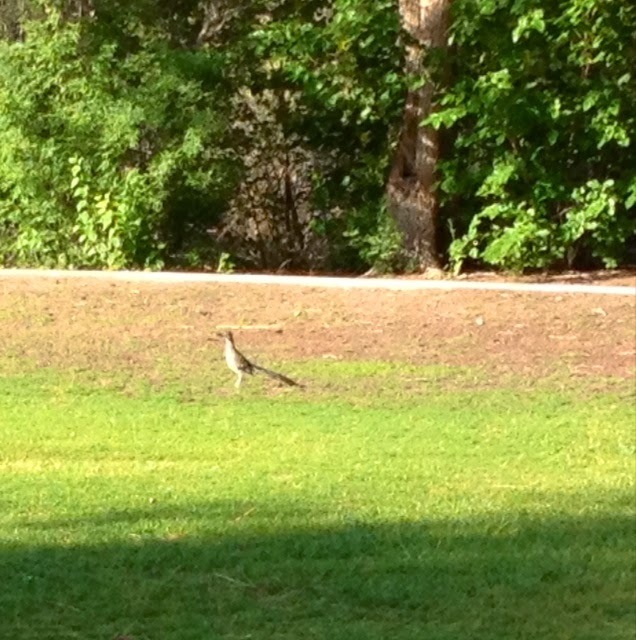 I think this speedy bird must be Beez's totem; roadrunners show up wherever he goes. I never get good photos of them. 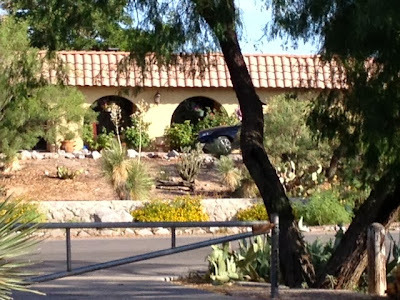 This was the best of the many that I took that morning, as the roadrunner checked out the bunnies across the way. Remember that you are using your imagination, please. 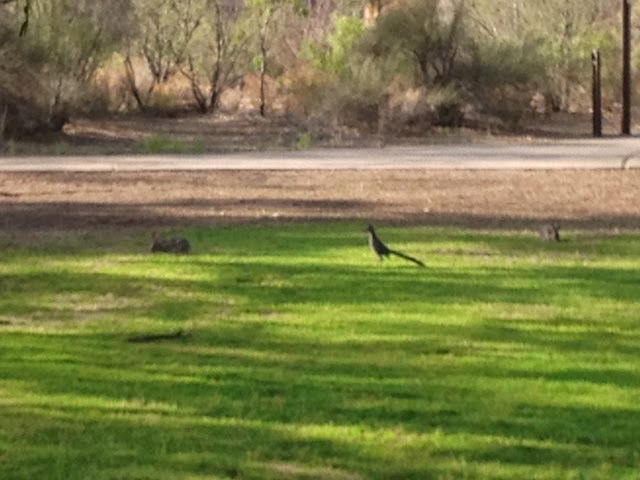 The roadrunner greeted the rabbits like they were old friends. The four of them played a crazy game of Beep-Beep-Bunny tag all around the lawn, then away down a desert trail, around some cactus, down into a big arroyo, and out of sight. I have no YouTube video of the game to prove it, but I'm sure you believe me. You can see it with your imagination, right?